The abbreviation MRI stands for magneticresonance imaging. A method of investigation of internal organs, which is based on the measurement of the electromagnetic response of nuclei of hydrogen atoms. They are excited by the combination of electromagnetic waves inside the intense magnetic field. In 1973, the chemist Paul Lauterbur published in a magazine article about creating images with induced local interaction and gave examples of images obtained by magnetic resonance imaging. These studies formed the basis of Peter Mansfield, who was engaged in the improvement of mathematical algorithms for producing images. There is a version that a device for nuclear magnetic resonance imaging (NMR) was constructed in 1960 the Soviet scientist V. A. Ivanov. The term NMR was subsequently replaced by MRI. This is due to the panic fear of radiation those people who knew about the tragedy at Chernobyl in 1986. Study on the method of magnetic resonance imaging became routine medical practice and is widespread. In 2003, Paul Lauterbur and Peter Mansfield were awarded the Nobel prize in medicine. Has patented method and created the first MRI scanner for commercial purposes American of Armenian descent Raymond Damadian. Modern magnetic resonance imaging allows to obtain images of internal organs, including the brain and spinal cord without invasive (penetrating) procedures. Thanks to the development of computer technology have the opportunity to perform virtual endoscopy, that is, to create a three-dimensional model based on MRI images. Virtual endoscopy is widely used by urology, angiology, Oncology. Brain MRI is a method of functional magnetic resonance imaging. Its purpose is to measure the hemodynamic response induced by neuronal activity. During the study creates a map of the cerebral cortex, which are well visible region responsible for speech, memory, vision. When a particular area is involved, it increases the flow of blood. In functional MRI, the patient performs a number of tasks, which allows to register the changes. Functional MRI is now actively developed as a method of neuroimaging. The advantages of the procedure are many: the lack of radiation exposure, low invasiveness, availability. 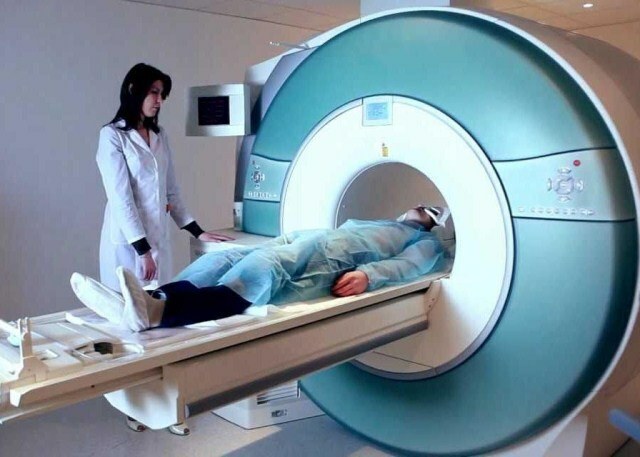 Using MRI specialists diagnosed developmental disorders of the brain, the presence of tumors at different stages, vascular abnormalities, stroke, disease of organs of vision and hearing, dysfunction of certain parts of the brain, diseases of the nervous system (e.g. multiple sclerosis). Often prescribed an MRI to determine the cause of regular headaches. Before the MRI there is no need to refuse drugs, physical activity or change diet, if it is so requested by the doctor. In some cases MRI is done with contrast, so if you have any allergies, you should notify your doctor or nurse. In addition, you should supply the specialist know, do your body any foreign objects such as shrapnel, pacemakers, braces on their stomach or heart and so on. The doctor needs to know if you have claustrophobia (fear of closed spaces) and bronchial asthma. A relative contraindication to MRI is pregnancy. Before procedure it is necessary to remove all the decorations, leave outside the room for studies of cell phones and other electronic devices, credit cards, lighters, glasses and other items containing metal. The patient lies on a movable table. The assistant records the body with the help of rollers and belts. If scheduled for MRI with contrast, the nurse intravenously injects essential substance. Specialist moves the table to the patient's head was under the magnet. This procedure usually takes about 20-30 minutes. MRI is completely painless. Some patients may feel discomfort being in a closed space capsule and keeping perfectly still, so you have to ask the doctor to give you a mild sedative.